In the 2nd part of the 3 part Arashiyama series, I will be introducing to you 2 temples that I visited. There was one temple that I briefly walked past it since I have been visiting quite a number since morning. I was on my way from Okochi Sanso, I can’t help it but stood there and admire this beauty. It should be really good to work around this area or even live around here… The color were amazing. Walking further down, I met 2 ladies who was trying to get a real nice picture of the autumn leaves as the background. I too stayed to take my version of it. And even sat on the ground to take a photo. Nature here was unbelievable. I am in love with it!!! As I continue on the path, I made it to Jojakko ji. Temple was built in 1596. Views were really nice. Jojakko ji has many maple trees planted. This was how I was greeted by the temple. Many visitors tend to visit Arashiyama for bamboo forest and Tenryuji, but they often forgot about the other smaller temples that houses many nice scenery. Personally, I prefer this over the bamboo forest. Maybe there were less visitors and also the view, like i have said it many times, were good. Onwards to the next temple, Nison in. 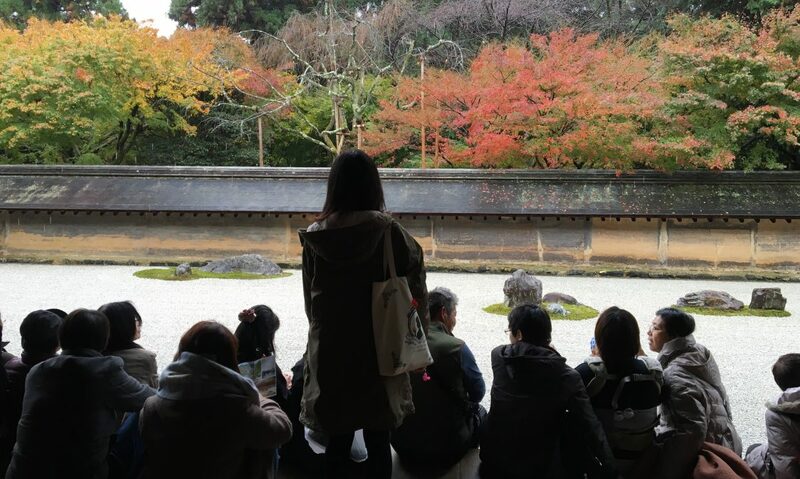 Nison-in is very similar to Jojakkoji and it is slightly larger. There would be a main hall where visitors have to take off their shoes to take a rest on the floor or visit the main hall for prayers. I just took a photo of it and did not visit it. In Kyoto, especially Arashiyama, you will see rickshaw pullers trying to negotiate a deal with the locals or someone who understand Japanese. They would usually target couples probably they could earn more. I walked past many of them more than 10 times but none approached me. They also do some introduction about the locations as I overheard some of them while pulling their customers for a scenic ride. After so these many visits to temples, I decided to walk to Togetsukyo Hashi (Bridge). It was really crowded so I decided to make a stop at a random tempura shop and bought a cheese ball. It was considered the best seller and they have a queue that did not seem to stop. Give it a try if you are at Arashiyama. After that, I continue my brisk walk to Togetsukyo bridge and on to the final temple of the day.